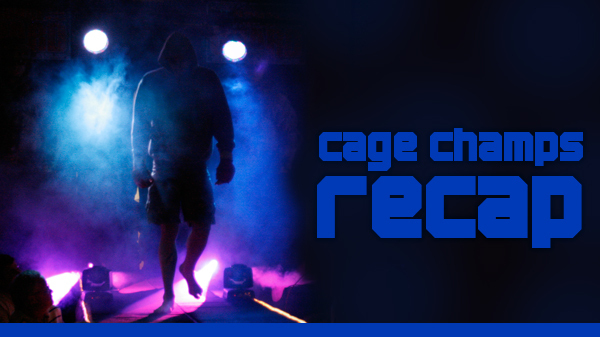 The Elks Lodge in Washington, MO played host to Cage Championships 37 on Saturday night. An event that showcased a talent-rich card filled with multiple title bouts and likely the last look at a local legend. Scott Cleve played the foil in the night's main event. Cleve, out of Colorado, was pitted against St. Louis' Steve Berger in a lightweight showdown. Berger entered the cage looking in top-notch shape as AC/DC's ‘TNT' filled the room. But it was Cleve who provided the dynamite. An early overhead right stunned and dropped Berger to the canvas. Berger latched on the Cleve's legs, attempting a takedown, but Cleve took the opportunity lock in a guillotine on the dazed Berger and choked him out for the first round victory. The fight brought Berger - who indicated in a pre-fight interview that a loss on Saturday would be the end of his fighting career - to 20-23-2. "That win was real good to get," Cleve said. "He's an established guy. I didn't quite expect it to go that way. From what I was able to see on video, I knew I was able to get him on the hands aspect. The only part I was worried about was the ground game with him being a black belt and being so experienced." Cleve felt he was in good shape after he landed the first barrage. "I knew he was stunned," he said. "When I saw the look on his face it calmed me down. It became, ‘Ok. I can do this.'" Cleve was definitely fighting in hostile territory as he nearly silenced the pro Berger crowd. "With our gym, we travel a lot," Cleve said. "(Tonight) is not anything that is uncustomary. It is very familiar for us. 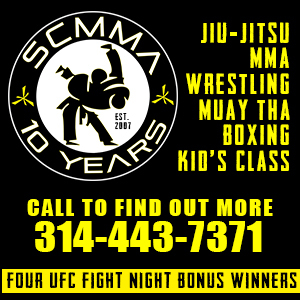 This is my first time fighting in Missouri but I've fought in Texas, Oklahoma, North Dakota, Canada, Florida, and Michigan. We travel all over." For exclusive interviews with several of the night's big winners check back on Monday. In the night's co-main event, Jake Collier returned to fine form with a convincing win over James Wade. Collier lost his first fight of his pro career in January but came back with a vengeance on Saturday. Wade, who fell to 5-10, brought the fight to Collier. But it was Collier who landed a big knee to the head when the pair came out of an early scramble. Collier followed that with a nice head kick that sent Wade to floor. Collier (4-1) followed with some wicked ground and pound and earned the TKO victory at 1:22. In the evening's two other pro fights, Ray Clayton pulled out a split decision victory over Steve Rustemeyer at heavyweight. Rustemeyer landed some nice punches in the first round but as the fight wore on, both fighters quickly wore down. Clayton had enough stamina to provide most of the offense in the final two rounds to improve to 4-2. Javon Wright showed off his striking skills in his pro debut against Davy Callow. Wright looked good early on, peppering Callow with leg kicks and then connecting on a nice head kick in the opening round. Callow put together his best stretch of work during the second round. Wright was able to pin Callow against the cage for most of the third round and ended the fight with some effective knees to the midsection. The three Spire belts that were up for grabs all made it to the fifth rounds on Saturday. Danny Branson put together a gutty performance to earn the Spire Featherweight title. Branson controlled the bulk of the fight against Buddy McGinnis (20-3) on the ground and won a unanimous decision. For the Light Heavyweight title, Brandon Cronin nullified Tony Souders. Souders, who has earned a reputation with his nasty, effective guillotine, had some opportunities against Cronin, but for the most part was smothered by the St. Charles MMA product. Cronin was methodical throughout, ending every round in dominate position before finally winning by armbar in the closing seconds of the match. He improved to 13-2 while Souders suffered his first lose to go to 7-1. In the fight of the night, and a fight of the year candidate, Malcolm Smith won a unanimous decision over Jeff Escobar. Escobar displayed a granite chin and an unbreakable will during the fight. But Smith's striking and overall athleticism proved too tough to corral. The pair fought through a brilliant first round before Smith took control in the second. In the third, Smith had things going his way before Escobar turned the tides, finished the round on top and firing away. In the fifth and deciding round, Smith had more in the tank as he finished strong to bump his record to 7-3. In the night's other fights; Nick Pohlmann's third-round submission over Chris Beal earned him the Cage Championships heavyweight title. Brandon Howard improved his record to 4-0 with a submission victory over Justin Yacko in the second round. In his first fight, Adam Muffler won by submission over Rod Miles in the second round.